Holiday Season is quickly approaching so why not be pro-active with some recovery and relaxation now! 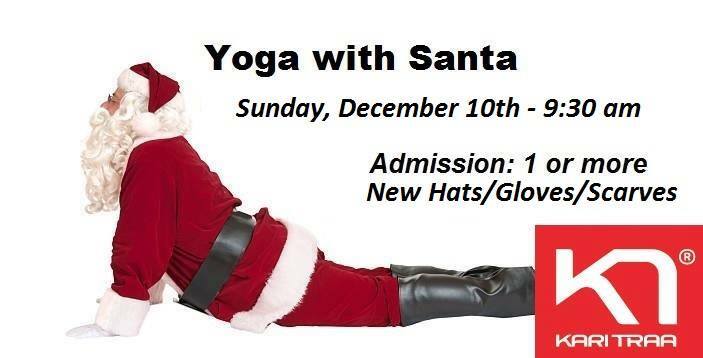 Join us for Yoga with Santa! Fleet Feet Staffer and Yogi, Joelle Mathews will be leading an hour long yoga class starting at 9:30 am for beginners and advanced yogis alike. The class is presented by Kari Traa apparel. Please Bring your own mat, the class will be limited to 30 people so please sign up at the link below. "Cost of admission" is just 1 or more new winter hats/gloves/scarves which will be donated to Journeys End. All welcome! Recovery Yoga + helping others = Win Win!